HERE’S HOW IT WORKS: No purchase necessary. Entrants must be at least 18 years of age, live within the Oklahoma City Thunder broadcast viewing territory (portions of Oklahoma, Kansas, Arkansas, Missouri and Nebraska). Sweepstakes begins at 8:00AM CST on 1/14/19 and ends at 11:59 CST on 2/15/19. Entries can be made by submitting information via okcthunder.com/onthefly. Two (2) winners will be chosen after the final submittal date. Entrants may only qualify via the aforementioned methods of entry. The Thunder on the Fly promotion is sponsored by OKC Thunder (“Sponsor”) located at 208 Thunder Drive, Oklahoma City, OK 73102. PRIZES: Sponsor will choose two (2) Winners from all entries. One (1) Grand Prize Winner will receive a trip for two (2) to see the Oklahoma City Thunder play the Los Angeles Clippers game in Los Angeles, California, on March 8, 2019. 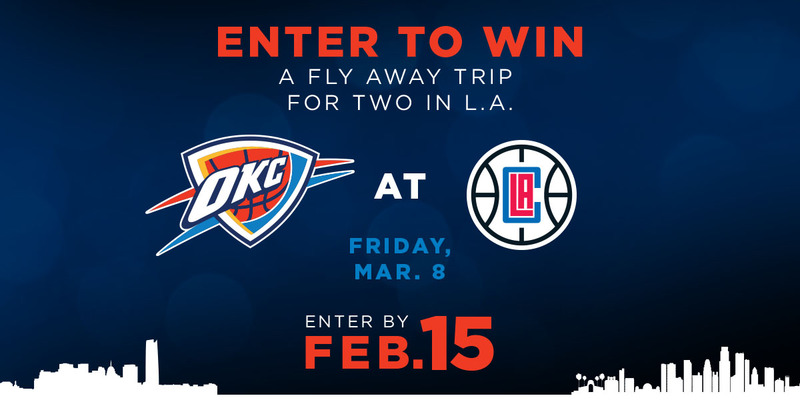 Trip includes round-trip airfare for two (2), one (1) hotel room accommodation for winner and guest for two (2) nights, FOX Sports studio tour in Century City, California, two (2) FOX Sports Swag Bags, and two (2) tickets to the March 8, 2019, Oklahoma City Thunder at Clippers game (Total Grand Prize Value: $2,340). One (1) First Prize Winner will receive two (2) tickets to the Oklahoma City Thunder vs. Nuggets game on Friday, March 29, 2019, at 7:00 pm in Oklahoma City, early entry into Chesapeake Energy Arena, and dinner for two (2) in the Budweiser Brew House (Approximate Prize Value: $750). Odds of winning depend on number of eligible entries received. PRIZE REDEMPTION: Winner will be contacted by an Oklahoma City Thunder representative via phone within twenty-four (24) hours after the winner is chosen so that prize may be organized and delivered. ELIGIBILITY: Sweepstakes open only to legal residents of Oklahoma, Kansas, Arkansas, Missouri and Nebraska metro areas that fall within the Oklahoma City Thunder’s television broadcast viewing territory. Employees of FOX Sports, Cox Communications, Inc., the Professional Basketball Club LLC, the National Basketball Association and its Member Teams, NBA Properties, Inc., the Women’s National Basketball Association and its Teams and Operators, WNBA Enterprises, LLC, and their respective parents, subsidiaries, affiliates, partners, dealers, advertising and promotion agencies, manufacturers or distributors of sweepstakes materials and their immediate families (parents, children, siblings, spouse) or members of the same household (whether related or not) of such employees/officers/directors, and their respective parents, subsidiaries, affiliates, directors, officers, governors, distributors, advertising and promotional agencies, their immediate family members and/or those living in the same household of each are NOT ELIGIBLE. Void where prohibited by law. All federal, state and local laws and regulations apply. All federal, state and local taxes are the sole responsibility of Winner. Entries originating from any other jurisdiction will be deemed ineligible. GENERAL RULES : By entering, entrant agrees to fully release, forever discharge, hold harmless and indemnify, FOX Sports, Cox Communications, Inc., the Professional Basketball Club LLC, the National Basketball Association and its Member Teams, NBA Properties, Inc., the Women’s National Basketball Association and its Teams and Operators, WNBA Enterprises, LLC, and their respective parents, subsidiaries, affiliates, directors, officers, governors, suppliers, distributors, advertising/promotion agencies, and each company’s officers, directors, employees, agents representatives, and successors and assigns (collectively, the “released parties”) from and against any claims, costs, liabilities, losses, injuries and damages or causes of action (however named or described), with respect to or arising out of (i) entrant’s participation in the sweepstakes promotion, or (ii) the quality, receipt, possession, use or misuse of any Prize awarded herein; or (3) any travel or activity that is related to the sweepstakes or any prize. Acceptance of a Prize constitutes permission to use Winner’s name and/or likeness for purposes of advertising and trade by FOX Sports, Cox Communications, the Professional Basketball Club LLC, the National Basketball Association and its Member Teams, NBA Properties, Inc., the Women’s National Basketball Association and its Teams and Operators, WNBA Enterprises, LLC, and their respective parents, subsidiaries, affiliates directors, officers, governors, employees and agents, without further authorization, compensation, or remuneration, unless prohibited by law. By participating in these sweepstakes, entrants agree to be bound by these Official Rules and the decisions of the Sponsor. Sponsors not responsible for any typographical or other error in the printing of the offer, administration of the sweepstakes or in the announcement of Prize. TAXES: Winners are solely responsible for any and all applicable federal, state, and local taxes related to the Sweepstakes. WINNERS LIST: For the name of the Winners, please send a self-addressed stamped envelope with first-class postage affixed to: OKC Thunder, c/o Marketing, 208 Thunder Drive, Oklahoma City, OK 73102. Requests must be received by 3/31/19.